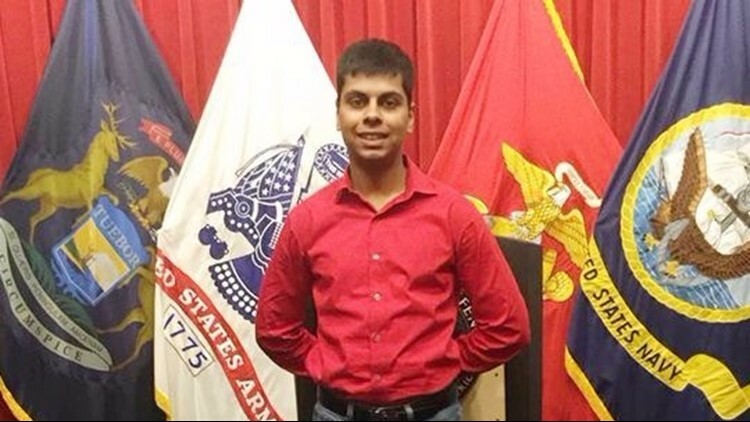 Raheel Siddiqui, 20, of Taylor, died during U.S. Marines boot camp training in South Carolina in March 2016. Siddiqui's family — which has yet to succeed in getting a local coroner to reverse the finding of suicide — filed the $100 million lawsuit against the Marine Corps and the government. A federal judge in Detroit on Tuesday dismissed a $100 million lawsuit against the U.S. Marine Corps brought by the family of Raheel Siddiqui, who died in a fall from a stairwell at the Marines' Parris Island, S.C., boot camp in April 2016. In dismissing the Siddiqui family's case, U.S. District Judge Arthur Tarnow said he was bound by federal precedent requiring him to do so in cases involving liability stemming from harm to military personnel, despite expressing "strong reservations" about it. The family — contacted through its lawyer, Shiraz Khan of Southfield —didn't immediately respond to the decision. It is the latest chapter in a case that, from the start, has received international attention, leading, in part, to the court-martial of Siddiqui's drill instructor and several investigations into recruit hazing and abuse at the famed boot camp on the South Carolina coast. Siddiqui, 20, was a former valedictorian at Truman High in Taylor when he entered the Marine Corps and was sent to Parris Island for training. But just days after his formal training began, he died in a three-story fall from a barracks stairwell that the Marine Corps quickly called a suicide. The family steadfastly rejected that suggestion, saying Siddiqui, as a faithful Muslim would not have killed himself, despite the Corps' contention that he threatened to do so just days before he died. But in the investigations that followed, some 20 personnel at Parris Island were disciplined for recruit abuse or hazing and it was alleged that Siddiqui — along with other Muslim recruits — had been referred to as "terrorists." Last November, Siddiqui's drill instructor, Gunnery Sgt. Joseph Felix, a 15-year Marine Corps veteran of wars in Iraq and Afghanistan, was sentenced to 10 years' confinement for mistreating recruits, including Siddiqu and another Muslim recruit he was accused of ordering into a dryer on base and turning it on, burning him. In Siddiqui's case, Felix was found guilty of forcing the recruit to run sprints in the barracks after he requested medical attention for a sore, bleeding throat. According to prosecutors, when Siddiqui collapsed on the barracks floor, Felix slapped him at least once across the face before the recruit got to his feet, ran out an exterior door and leaped over a railing, his foot catching on it as he went over. Lt. Col. Joshua Kissoon, who oversaw Felix, also pleaded guilty to charges stemming from the investigation but did not receive any reduction in rank or a prison sentence. Siddiqui's family — which has yet to succeed in getting a local coroner to reverse the finding of suicide — filed the $100 million lawsuit against the Marine Corps and the government saying Raheel Siddiqui and the family should have been warned about the dangers he faced, given that Felix was already being investigated for an alleged earlier incident when his boot camp began. The family also argued that Siddiqui, as a recruit, was not active duty military and the so-called Feres doctrine —a decades-old Supreme Court decision that effectively bar suits for injuries sustained by military personnel related to their service — shouldn't apply. Tarnow said despite his doubts about Feres, his hands were tied. "The question is whether Pvt. Siddiqui's injuries arose out of, or were sustained in the course of, activity incident to service," he wrote. "The answer, according to binding precedent, is yes, even though (he) was not yet a Marine." "The court cannot let the family move forward with their suit," he continued. "The Feres Doctrine ... bars the suit. That doctrine has long been heavily criticized ... Since Feres, soldiers suffering even the most brutal injuries due to military negligence have been shut out of the court." "Nevertheless," he said, "and despite strong reservations, the court remains bound by Feres and its progeny." Contact Todd Spangler at tspangler@freepress.com. Follow him on Twitter at @tsspangler.